$2900 plus $688 licensing fee. 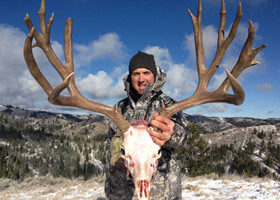 Cow elk hunts are also available on our free range property. $5400 plus $688 licensing fee. Management bulls are mature bulls discounted for genetic purposes. $6400 plus $688 licensing fee. 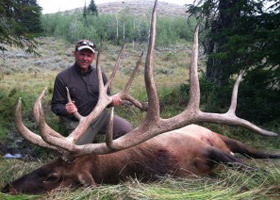 Trophy elk hunts are for bulls up to 330″. $8400 plus $688 licensing fee. 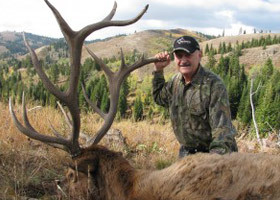 Upgrade elk hunts are for bulls from 330″-360″. 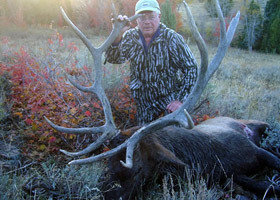 Each year we harvest the biggest elk in the world. 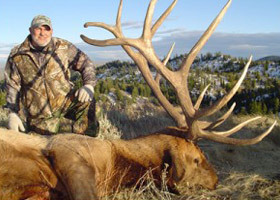 Please contact us if you are looking for a giant bull elk. $5900 plus $290 licensing fee. $7900 plus $290 licensing fee. 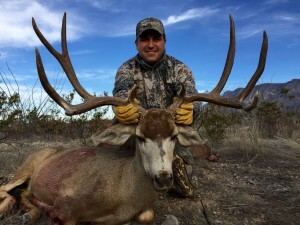 Mule Deer hunters have averaged 90% success. 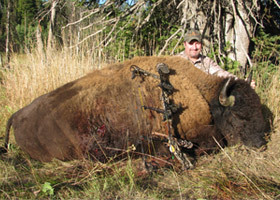 Shiras moose hunts are 100% success. 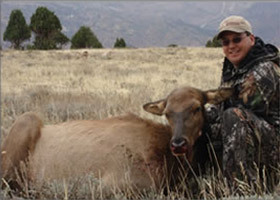 Free range elk hunts are 80% success and take place on private land. 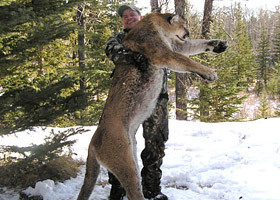 Cougar hunts take place December through March. $2900 plus guide and dog fee and $340.50 licensing fee. 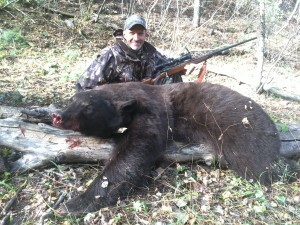 Bear hunts take place in Idaho in September and October. 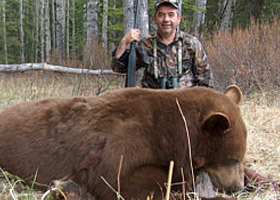 These hunts are reserved for hunters that tag out early and would like to add on a bear. 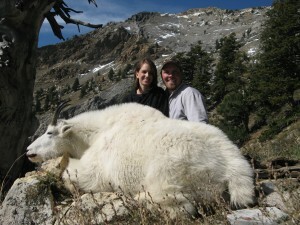 If you would like to hunt Mountain Goats, contact us. We can obtain special guaranteed tags for goat. 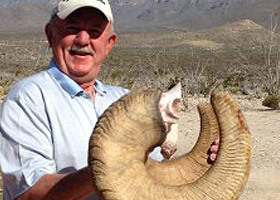 Desert bighorn sheep hunts take place in December and January. Sales Tax: All hunts and licenses are subject to state sales tax, 6% for Idaho and 7.1% for Utah hunts. 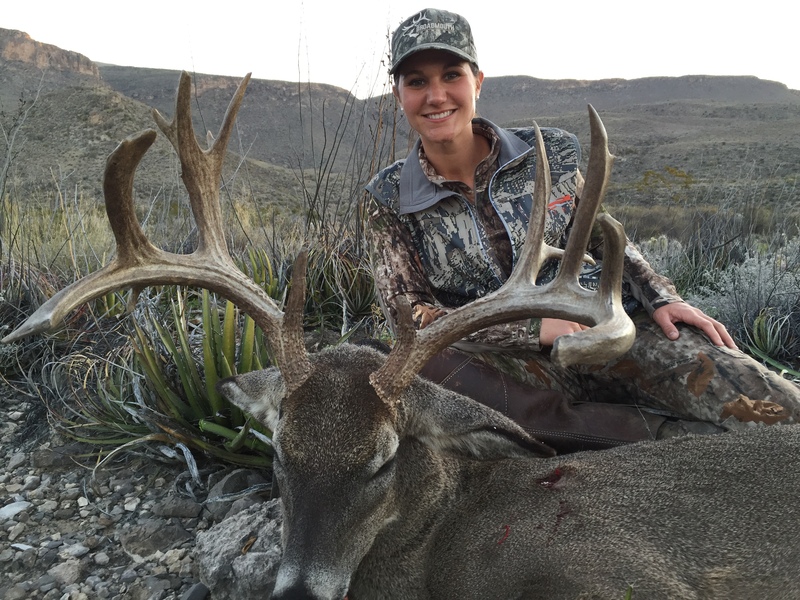 Mexico hunts do not have sales tax. * licensing fees may vary. A 50% deposit is required to confirm your hunting dates. The balance is due upon arrival in cash, cashiers, or certified check. Upon your arrival to Salt Lake City, Idaho Falls or Monterrey, Mexico, the hunt price includes lodging, food, one on one guide, transportation, and trophy care. You will be responsible for the cost of shipping your trophy and processing your meat.If you want to bring your favorite non-hunting companion, the cost is just $800 for guest sharing a room and $1500 for guest in separate bedroom, and they can accompany you on the mountain. 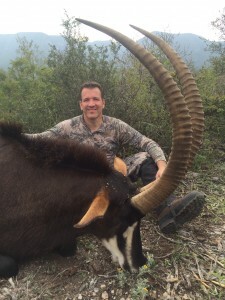 We have very qualified guides who will properly position you to shoot at your animal. lf an animal is wounded, and not recovered, this will be counted as your kill. 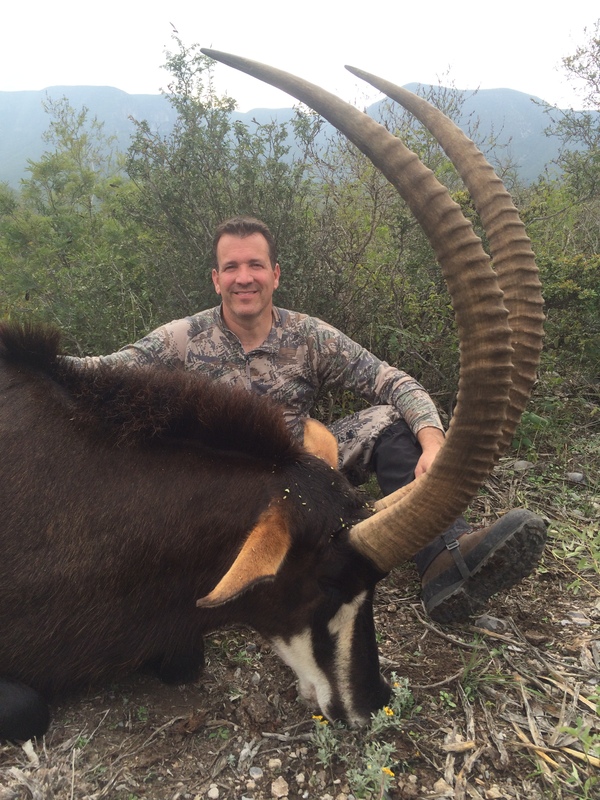 With the quality of our guides we rarely lose an animal, but it can happen. While maintaining all reasonable care and precaution for the safety of our clients we assume no responsibility for any health risks, accident or loss or expense arising there from. If you have any health or medical concerns, medication, or dietary needs please let us know. You will be hunting in some of the most beautiful country we have seen. It is mountain terrain with pine and aspen pockets, oak and maple brush covered slopes with some open meadows. There is nothing quite like leaving our lodge, going into these mountains and hearing the bugle of the animals you are pursuing. 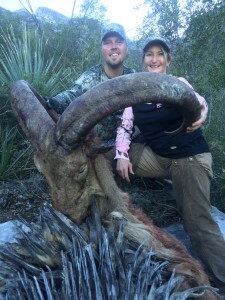 Hunting is a part of our lives we take very seriously with some of our fondest memories coming from these experiences. We are committed to making your hunt an experience that will be second to none.